Enables displaying images, including animated GIFs, throughout source code from an <image> tag. To display an image, either from the web or your local disk, include a tag in the source code comments. Use the url or src attribute to specify its location and optionally scale to indicate a scaling factor. 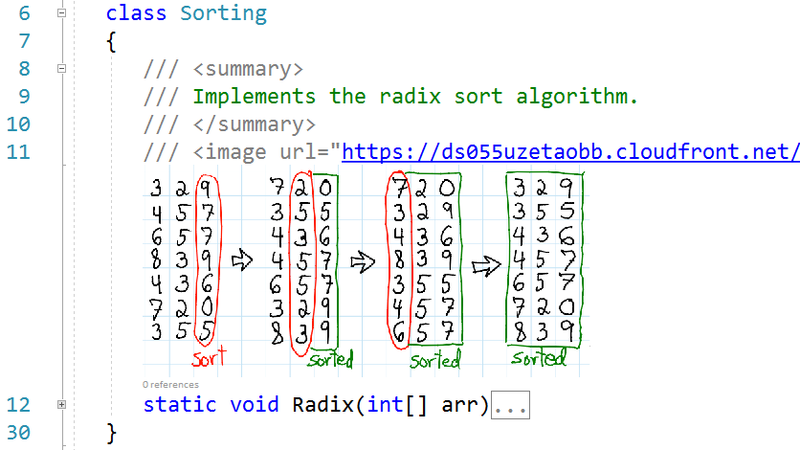 /// Implements the radix sort algorithm. Use images and especially animated GIFs judiciously! A larger number of images in a document might decrease the responsiveness of the editor. Special thanks to Shmueli Englard for this contribution to the project.